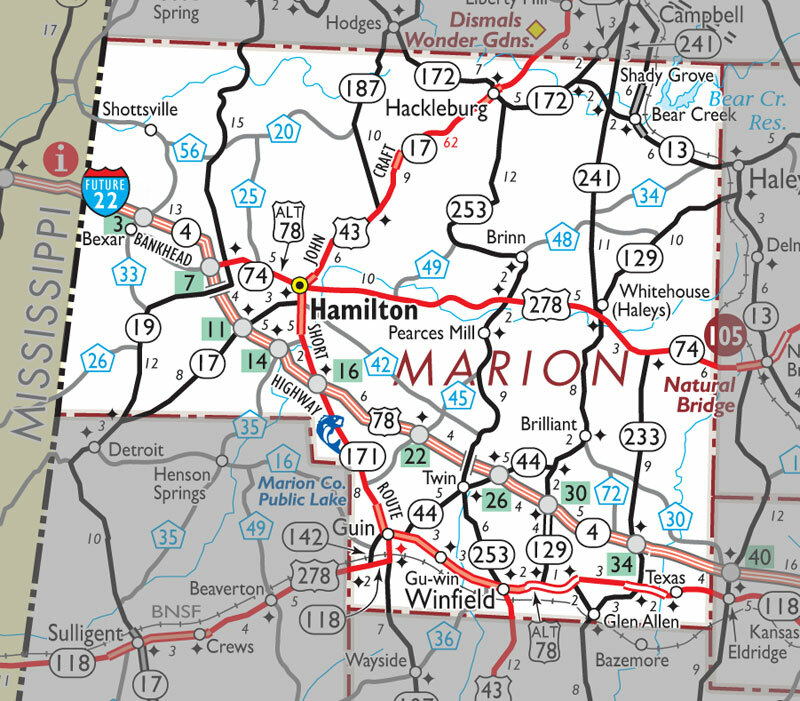 HAMILTON - Saying the final decision would be made after consulting with the two victims’ families, Marion County District Attorney Jack Bostick has confirmed he expects to seek the death penalty against a Hamilton man who shot and killed two Hamilton residents earlier this week. “I anticipate charges will be filed against Jimmy Cooper for capital murder of both Donnie Miller and Linda Cole,’’ said Bostick in a press conference held at Hamilton City Hall on Wednesday, Feb. 10. Miller was 67 and Cole was 61, according to Alabama Law Enforcement Agency (ALEA) Public Information Officer Johnathan Appling. Prior to presstime on Thursday, Feb. 11, Marion County Sheriff Kevin Williams confirmed Cooper was charged with two counts of capital murder earlier in the morning. He has also been charged with one count of first-degree kidnapping for holding Hamilton attorney Scott Hunt at gunpoint as the events of the day first began to unfold at his law office on the courthouse square in downtown Hamilton, Williams said. The press conference was held about four hours after an active shooter alert was sent to local law enforcement agencies shortly before 11 a.m. The turn of events which left an entire community on edge and two local residents dead began as Cooper allegedly opened fire at Hunt’s law office. While law enforcement at the press conference would not confirm the order in which the victims were shot, Bostick said the law office is the site where Miller was killed, beginning the rampage. Cooper, 57, is known to have fled from the law office on foot, heading about two blocks southward to the accounting office of Lawler and Cole at 321 First Street Southwest. Alabama Secretary of Law Enforcement Spencer Collier confirmed that two sheriff’s deputies were involved at the scene when the standoff ended as well as one officer from the Hamilton Police Department. Hours later, ALEA released a statement saying, “Additionally, a private citizen reacted and assisted law enforcement in the exchange of gunfire with the suspect.” It was the first confirmation of anonymous-sourced media reports the citizen had tried to assist by hiding behind a wall at the bank and shooting at the suspect. Appling said he could not release the name of the citizen as of Thursday morning, Feb. 11. “Although we will conduct a thorough investigation of the officer-involved shooting, the initial indication is that the deputies, officers and a private citizen acted without hesitation and probably prevented the further loss of life,” Collier said in the release. The 8 p.m. statement also noted Cooper was recovering and under guard by Alabama Law Enforcement Agency officers at UAB Hospital. Williams has also said a private citizen was involved in the process, but said no further details could be released pending further investigation. Collier said the surveillance video reviewed by authorities was not obtained from a body camera. He would not say if the footage had been secured from an exterior camera seen near the rear of First State Bank. The back of the bank and the accounting office share a common corner with the video camera possibly capturing the exchange between officers and the shooter. While this area had been roped off by authorities in an effort to preserve any evidence at the crime scene, small yellow markers could be seen on the narrow street marking what is believed to have been shell casings left behind from the exchange. The windshield of a black suburban parked behind the accounting office and bank had been damaged with media reports indicating it was from behind the wheel of the vehicle one of the shots fired at the shooter originated. Asked at the press conference about this detail in the case, authorities refused to answer, saying this was part of the ongoing investigation. In response to a question from the media covering the press conference, Williams said the confrontation between Cooper and his officers had taken place outside, as this is where the shooter was at the time deputies arrived near the rear of the accounting office. Television cameras from all four Birmingham stations were in attendance at the 14-minute press conference with crews from at least one Mississippi station also present. Bostick said there was no known motive at this time, but would later say the shooter is believed to have had a business relationship with one victim (Miller) and was the client of the other (Cole). The district attorney said his office was working with law enforcement to ask questions and take statements from those with information in an effort to determine why these victims were targeted. “Today has put everyone in shock,’’ Bostick said when asked what the shootings had done to the community. “I have talked with both of them (deputies), and I was involved, too,’’ the sheriff said regarding the shooting. “We are struggling with it. This is small-town America. We do not expect that here . . . shootings. We do not have a lot of them in our county. This is a small town where everybody knows everybody. With Bostick referring the question earlier in the press conference to the sheriff due to the role his department plays in such situations, Williams said the shooter has had a history of mental illness. “I can tell you that Mr. Cooper last July, that there was a commitment order signed on him by a family member,’’ Williams said. “My office transported him to Jasper to be evaluated,’’ the sheriff said, saying Cooper was eventually released. Williams confirmed the weapon used in the shooting was a handgun, but offered no specific details as to the weapon recovered by authorities after Cooper was subdued. The sheriff said Cooper is not known to have any prior criminal history. The sheriff said he learned of shots being fired in the city’s downtown district while at his office at the county jail. The sheriff confirmed that officers from departments in Winfield, Guin, Hackleburg, Brilliant and Bear Creek had rushed to the scene to assist. He also commended the state agencies for assistance. Hamilton Police Chief Ronny Vickery was the last to speak at the press conference, saying the previous speakers had covered the necessary details. He added his department would be active in its own investigation and would be more than willing to assist the state in its investigation. Appling began the event by noting the State Bureau of Investigation would oversee the officer-involved shooting with the local authorities directing the investigation regarding the two homicides. The Hamilton Police and Marion County Sheriff’s departments will work together on the homicide cases. Vickery later confirmed in an interview with the Journal Record that one of his officers had ridden in the ambulance with Cooper from the scene to North Mississippi Medical Center in Hamilton. Cooper was transported by helicopter to the Birmingham medical center where officials with the Alabama Law Enforcement Agency were awaiting his arrival. Until news was provided by local authorities that the shooter had been apprehended and the threat to the community had been eliminated, the local high school, courthouse and Hamilton City Hall remained on lockdown. A multi-block area of the city’s newly-renovated downtown district was cordoned off by authorities shortly after the shooter had been taken down. Various departments were offering assistance attempting to direct traffic and collecting any evidence from the scene. Law enforcement officials could be seen concentrated at the site of the two shootings, the law office and the nearby accounting office. Hunt could not be reached for comment on Wednesday afternoon, Feb. 10. No one answered the phone at First State Bank late that afternoon. Several witnesses indicated they could not speak on-record of the event, as law enforcement and superiors at work indicated they did not wish them to recount details publicly. Hamilton Mayor Wade Williams said the shooting had a sad impact on the city that day. Williams thanked the officers involved, saying they may have saved more lives as a result. The Marion County Courthouse, Hamilton City Hall, Hamilton High School, Hamilton Middle School, and Hamilton Elementary School all were temporarily placed on lockdown after the shooting, but reopened very soon, possibly after about 30 minutes. All said no problems resulted and everything went smoothly. Hamilton High Principal Ronnie Miller said his school got the order to lock down and open up from Marion County Superintendent of Education Ryan Hollingsworth, who then came to the site. The doors of the classrooms were locked and no one, including faculty, was in the hallways during the lockdown time, he said. Marion County administrator Brooke Slatton said the lockdown at the courthouse was brief and no incidents occurred. Soon after the shooting, police blocked Third Avenue SW, from the back of the bank to the student center of First Baptist Church, and the block around Lawler and Cole. Second Avenue SW, in front of the Boman law office and the front of First State Bank, was also blocked off. The police tape was removed by Wednesday night about 6. Trucks from out-of-town TV stations were seen parked that night in the area of First Baptist Church, apparently for live remotes. By that night, the Associated Press carried an account of the story through its national wire summary for its mobile app. April Cole-Cagle, daughter of Linda Cole, posted on Facebook, thanking the community for their prayers.